Good morning and welcome to the OSAT Christmas in July blog hop. For my card I used Stampin Up stamp set Ornamental Pine for the background and sentiment and Hardwood for the wood border and the SU bird builder punch for the bird. 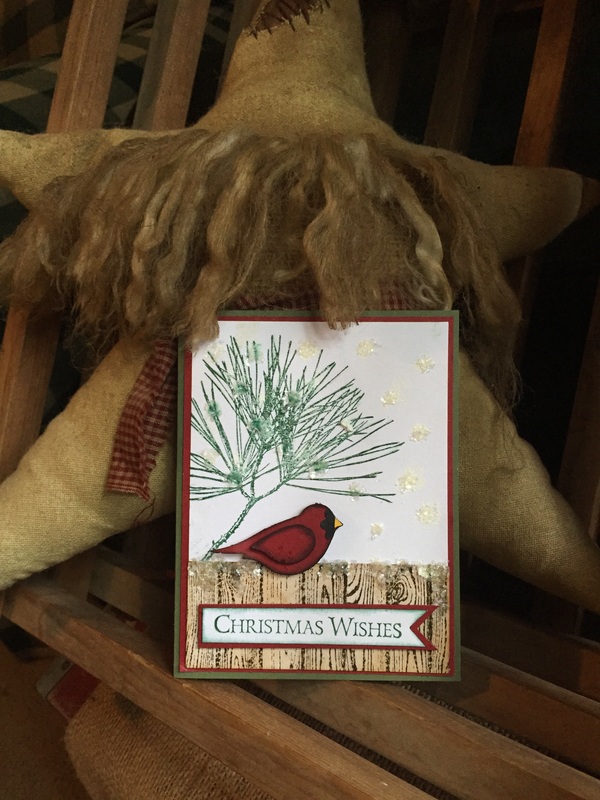 I outined the pine with my clear Wink of Stella brush and then accented the card front with glitter snow. 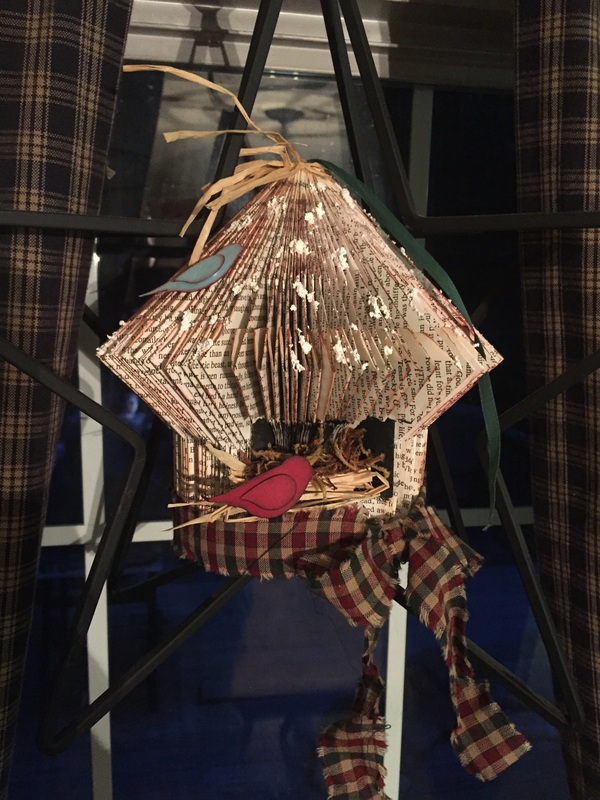 For my project I created a bird house from a book using a form of art called book folding. If you have never seen this search google and Pinterest for book folding and you will be amazed at the creations you will see. After folding all 567 pages I used a circle punch and created a hole for the birds nest and then painted the inside black and filled with raffia and moss. Next I grunged all the edges first with Tim Holtz Old Paper and then with SU Cherry Cobbler. I added raffia to the top and the green ribbon hanger was the built in page marker in the book. Next I used the SU bird builder punch and made one red bird and one blue bird and attached both to the birdhouse. To finish I used SnowTex and spotted it around the roof to create a snow effect and then tied a strip of fabric on the bottom edge. Categories: OSAT Blog Hop | Permalink. Your card is so beautiful and that sweet book folding project is amazing!!! Love your projects. The birdhouse is just adorable. Ginger this is gorgeous, I love the wood grain with the ice melting down it. The scene is beautiful. As for the birdhouse, I’m just chuckling thinking of you folding 567 pages, but the results are super cool, love it! It is all AH-mazing!! Especially love the details of your birdhouse. Will have to check out the book folding technique…very intriguing. Absolutely amazing projects!! great job! I’ve always been interested in book folding but have never tried. It looks amazing! Very nice projects! I love the rustic charm of these….Great job! Two great projects. I can’t even image folding and creating the bird house! It’s amazing! Loved both your projects. The little bird builder punch has been around for a while but it never loses its appeal. Lovely! Your book bird cage is totally amazing. I hadn’t heard of this art form before so will follow up on your tip to look on Pinterest. Thanks for sharing your interesting post and projects.